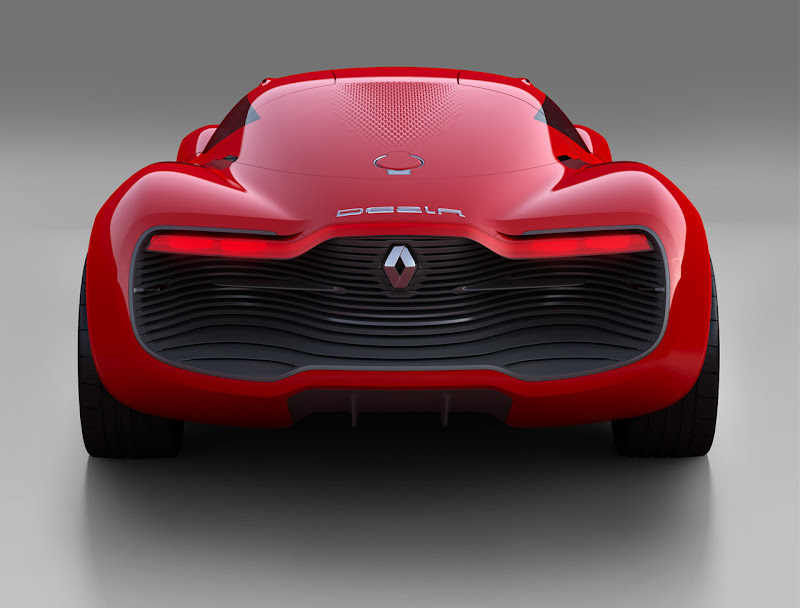 Renault has provided a first glimpse of its latest concept car, DeZir, ahead of this year's Paris Motor Show. DeZir stands out as an illustration of the brand's commitment to more emotional styling. DeZir's sensuous lines and bright red finish express passion. Powered by an electric motor, DeZir is proof that electric vehicles and a love of cars are by no means incompatible. 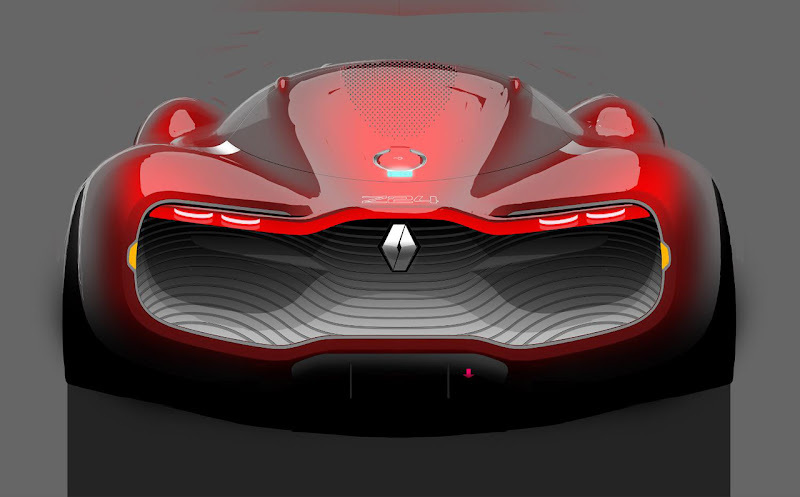 The DeZir project is the first to have been led by Laurens van den Acker and marks the start of a sequence of concept cars that will provide an insight into Renault Design's new vision for the future. 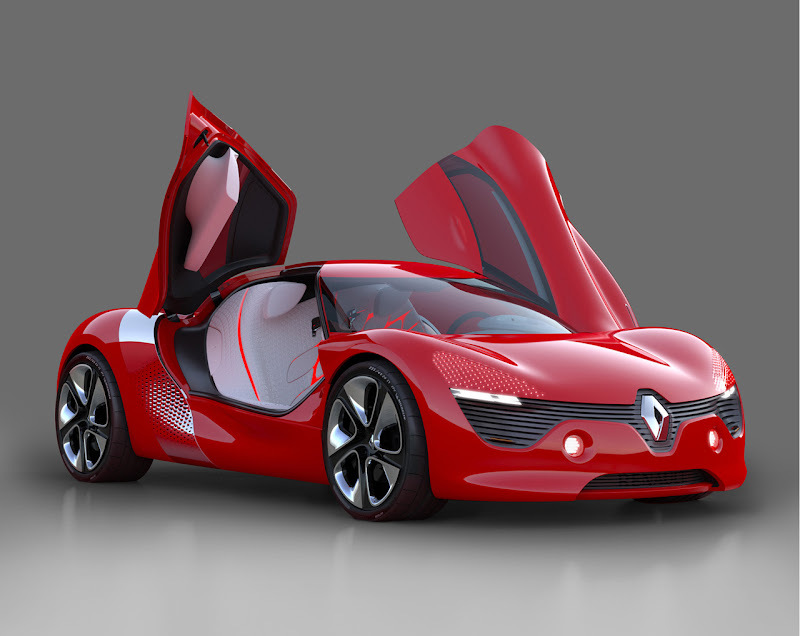 It also lays the foundations for the styling cues of Renault's forthcoming vehicles. 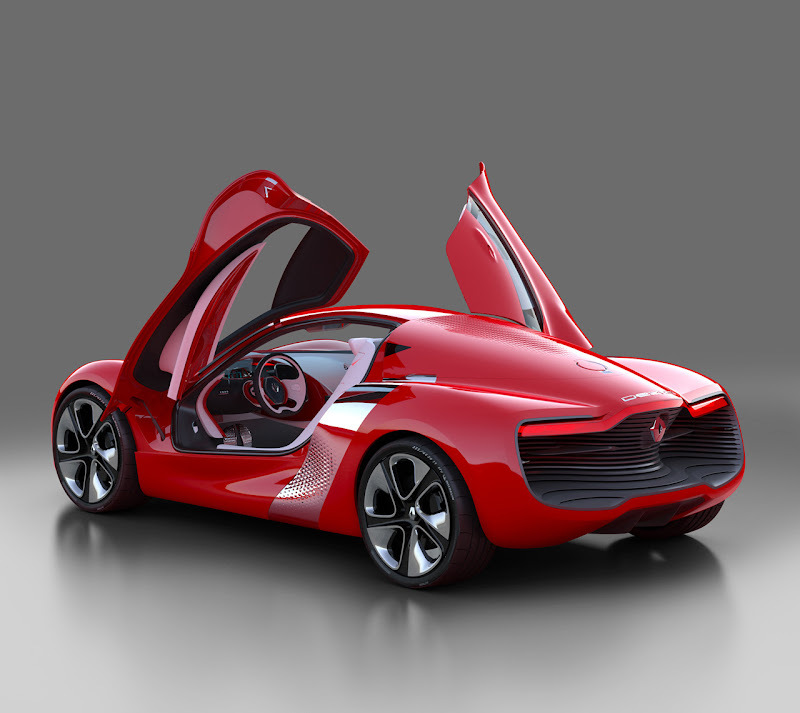 The public will get its first opportunity to see DeZir at the 2010 Paris Motor Show. 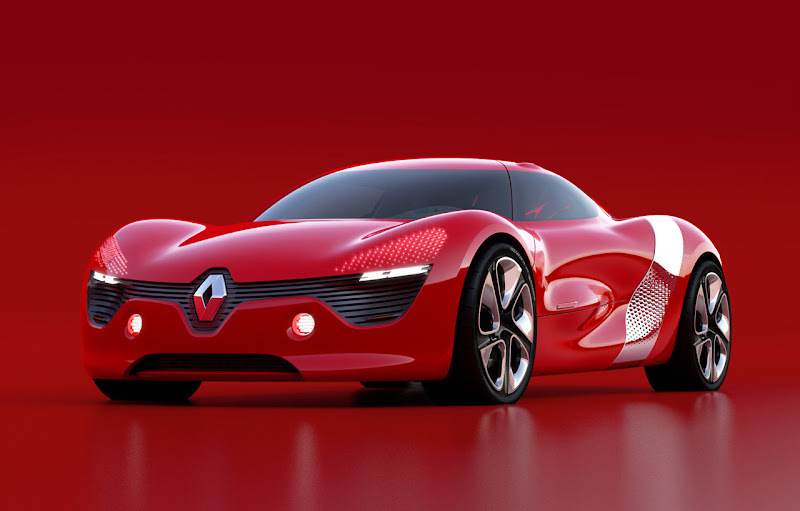 Under the leadership of Laurens van den Acker, Renault's Design Department has taken its inspiration from the brand's new signature 'Drive the Change' and explores Renault's styling roots to express the company's powerful human dimension via a new strategy founded on the notion of the 'life cycle'. This vision also builds on the bonds that are gradually forged between the brand and its customers at watershed moments of their lives, such as when they fall inlove, begin to explore the world, start a family, begin work, take time out to play and gain wisdom. This approach coincides with the introduction of a new Renault design language that takes its inspiration from the three keywords which communicate the brand's vision, namely 'simple', 'sensuous' and 'warm'. 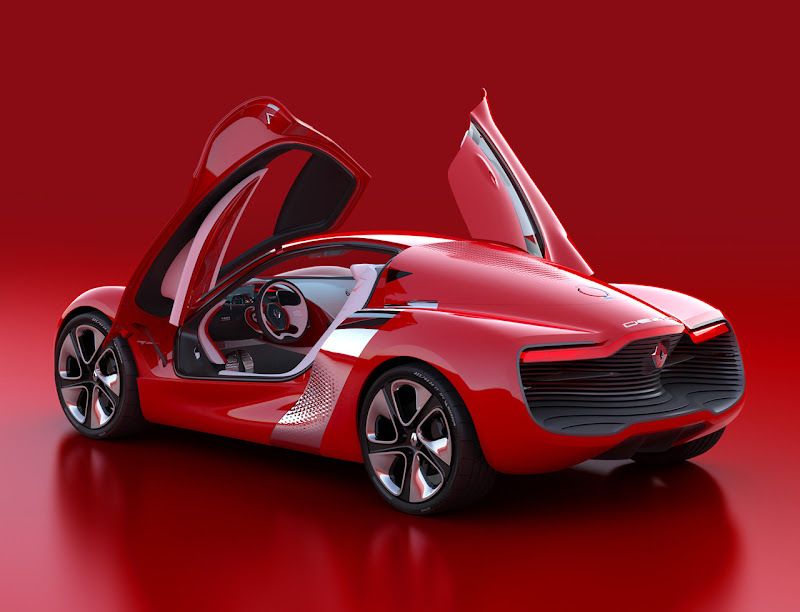 In keeping with this strategy, Renault's concept cars will progressively express this vision, paving the way for a product plan based on a range of rational, user-friendly cars. 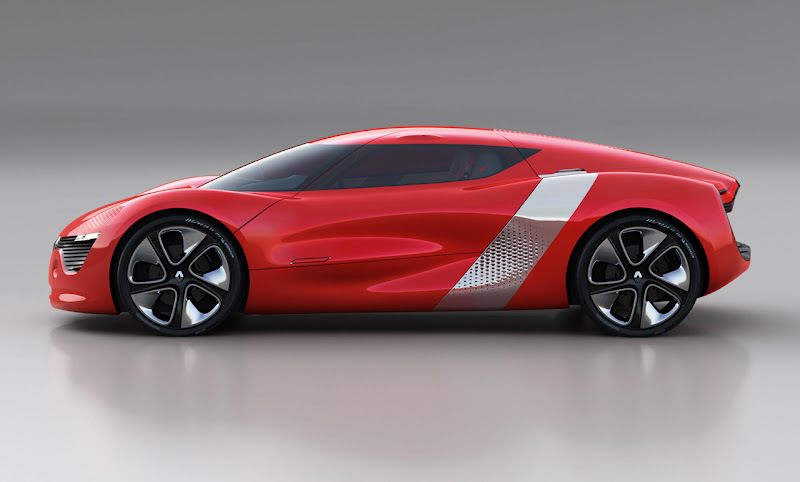 To implement this, Renault Design has revised its methodology, and a single team of designers will now be responsible for each new concept car and for the subsequent production model it previews. DeZir is the first project to be led by Laurens van den Acker and exemplifies the brand's new philosophy with regard to design. It also marks the implementation of the strategy based on the notion of a 'life cycle'. The first step involves falling in love, an experience that is perfectly illustrated by DeZir's powerful, sensuous styling and bright red finish; red being the colour associated with passion. "DeZir is a statement of our new formal design language which conveys notions such as movement, sensuality and emotion through ideal proportions, in much the same way as an object whose forms have been honed by nature. 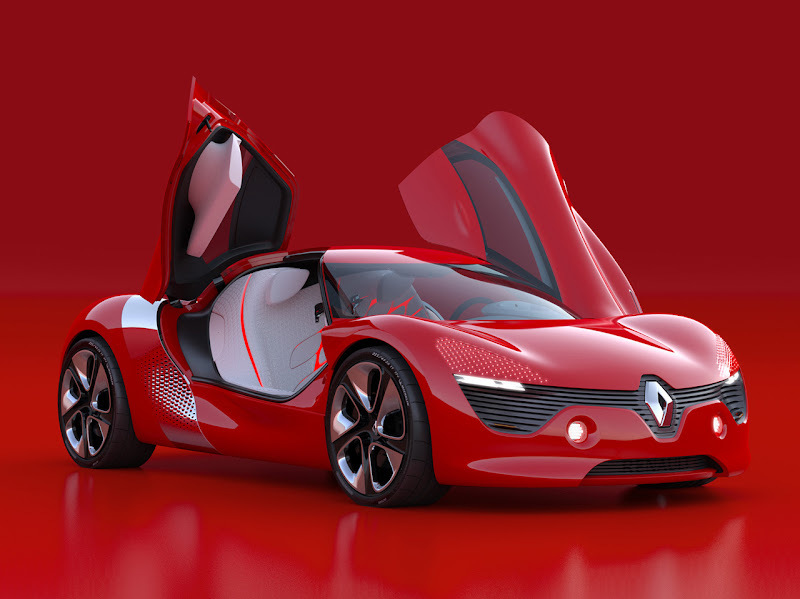 The result is a warm, stimulating design that says 'Renault'," explains Axel Breun, Renault's Director of Concept Car and Show Car Design. Fluidity was an overriding theme from the initial preliminary sketches, and was expressed by a blend of simple forms and generous volumes. "My early source of inspiration stemmed from the liquid sensation, wave-like movement and contrasts in light associated with certain rippled surfaces," observes Yann Jarsalle, who was in charge of DeZir's exterior styling. "By directly laying out volumes and not just joining together a number of surfaces by lines, I felt more in tune with the world of sculpture than with that of architecture." 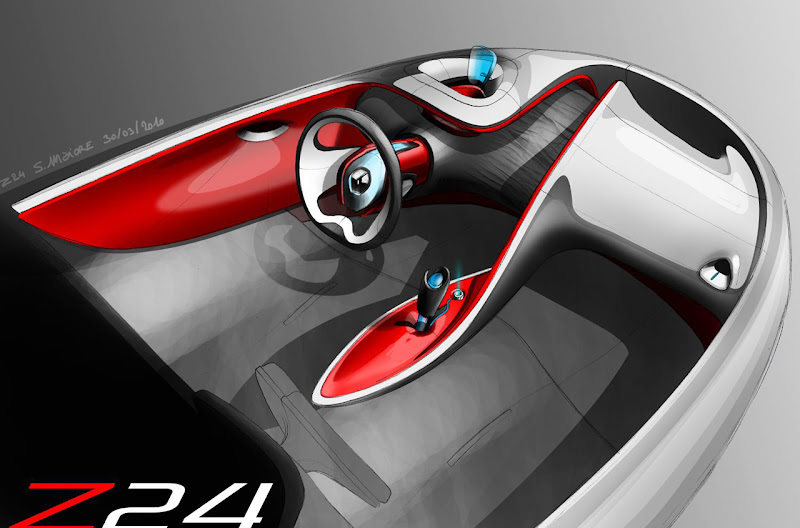 The result is a two-seater coupé which is both sculptural in spirit yet perfectly harmonious. DeZir's shape features prominent wheel arches that accommodate 21-inch wheels, the design of which took its inspiration from the notion of movement. Meanwhile, the sides feature a combination of flush and recessed forms that play on contrasting light patterns. 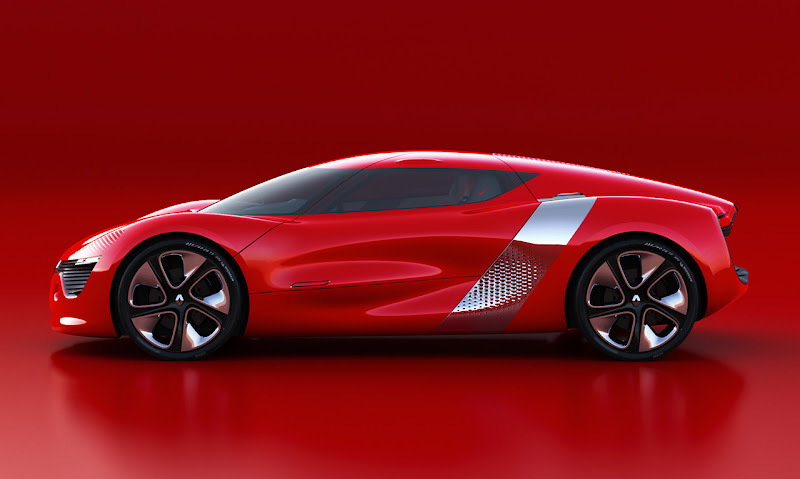 The 'Z' in the name DeZir is a direct reference to Renault's zero-emission Z.E. signature, and several features of its design are suggestive of two qualities readily associated with electric mobility, namely advanced technology and light weight. Indeed, the recessed, linear styling of the front air intake and the entire rear-end convey an impression of lightness in addition to efficiently channelling battery-cooling air from the front to the rear. To provide rhythm and balance to the overall package, this smooth, fluid skin contrasts with the ripple effect seen on the aluminium side panels, roof and headlight 'eyelids'. The design of these features alludes to the ripples which can form when a breeze blows over water, while the geometric pattern adds an unmistakable high-tech feel. The prevailing bright red colour of the body interacts with the graphical forms of the cross-drilled aluminium side panels which equally exude a sense of light weight and technology. The geometric forms of the glazed areas also contribute to DeZir's overall design and are reminiscent of a fighter-plane cockpit or certain endurance racing prototypes. The absence of a rear window is overcome by the fitment of two rear-facing cameras which provide the driver with a panoramic view of what is happening behind the car. 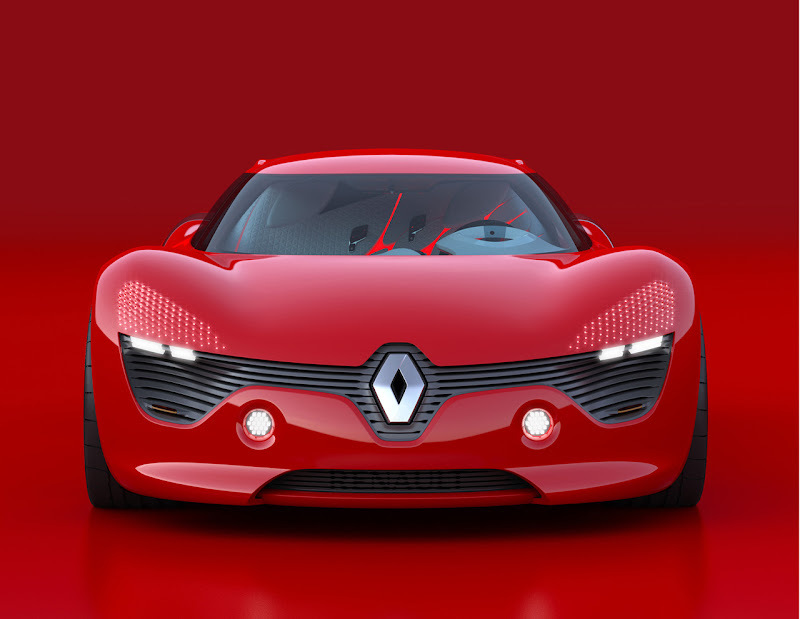 The creative thinking behind the design of the front end was aimed at recalling Renault's styling heritage, while at the same time paving the way for the design trends of the brand's forthcoming models. 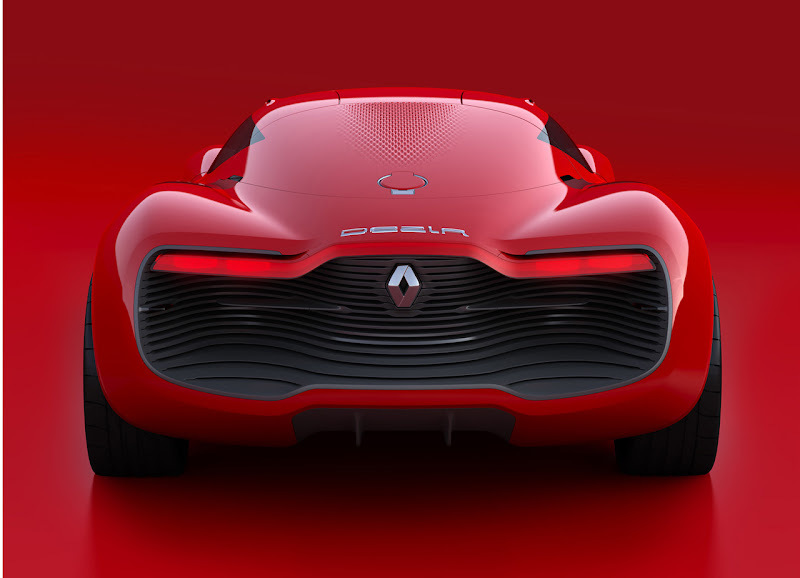 DeZir's front end features a full-width air-intake which strikes out either side of a large, vertically-positioned Renault logo that proudly displays the car's brand pedigree. Meanwhile, the chrome finish of the lozenge contrasts with the dark aspect of the grille to express the statement still further. The air scoops situated at the outer extremities of the front air intake are a legacy of Renault's formal styling language and form an integral part of the air intake's design, as do the headlights which sit above these scoops. 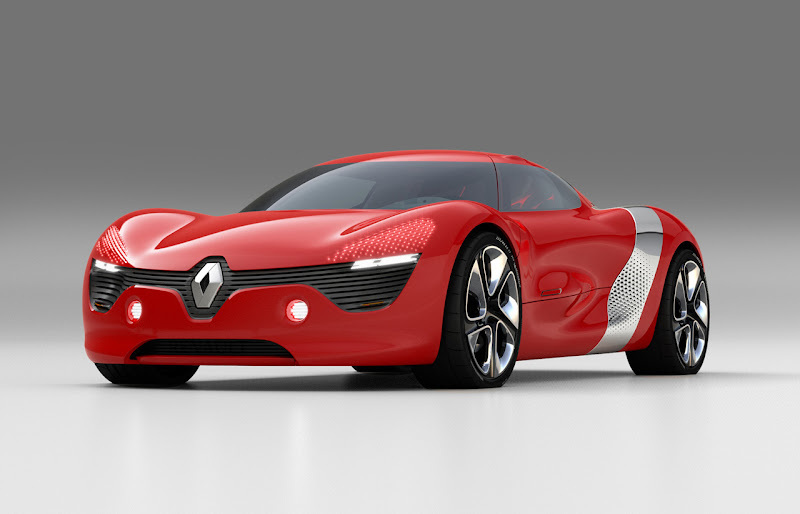 The front-end design previews the new front-end identity that is poised to become a feature of all Renault models in the future. The headlights take the form of backlit prisms, which make them a highly graphic feature. The perforated 'eyelids' add to this high-tech feel and contribute to DeZir's specific lighting signature. Rear lighting is provided by an illuminated, seemingly floating strip that extends across the full width of the car. The Renault logo is highlighted by backlighting through the fins of the grille and consequently appears to hover in the middle of this space. The gull-wing doors are another feature that embody automotive passion and reveal a refined interior, while the fact that the left- and right-hand doors open in opposite directions symbolises a ying and yang-style amorous harmony. The interior design also suggests lightness. "Love is a sentiment that lifts you; gives you wings," says Stéphane Maïore, who was in charge of DeZir's interior styling. "Inside DeZir, you feel like you're floating on a cloud," adds Stéphanie Petit, Colours and Materials Designer. The forms are soft and light, while the predominant colour is white, although there are also echoes of the same passionate red used for the exterior. 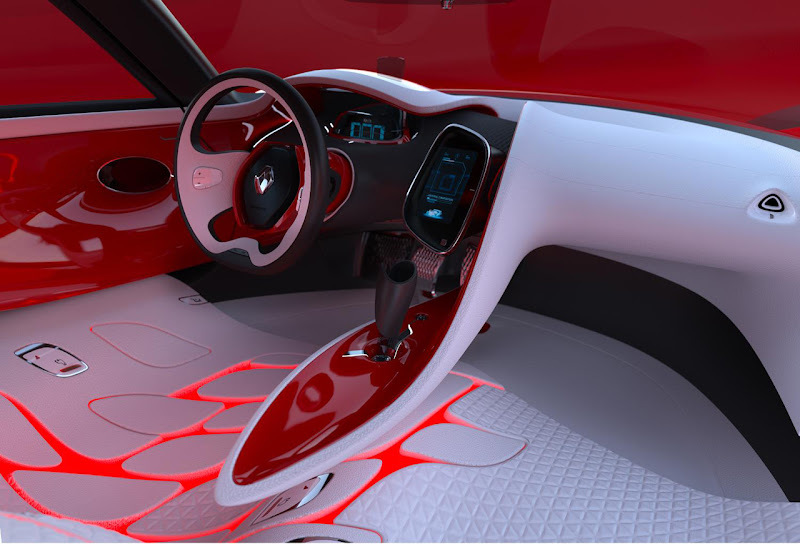 The materials employed for the interior, like the senses they awaken, are precious, with white leather upholstery and trimming for the seats, dashboard and floor, along with a red lacquered finish for the console and accessories. The one-piece, two-seater front benchseat provides cocoon-like comfort. To emphasise the sensation of shared passion and lightness, it comprises a number of interlocking elements trimmed in white leather, with a quilted pattern on the passenger's side, and a contrasting uniform finish on the driver's side, as if to suggest an inexorable attraction between the two. The embroidered pattern on the leather is based on a graphical representation of the Renault logo and is an example of refined of couture a la française. This technique also provides an indication of the forthcoming trend for future production models. DeZir is powered by an electric motor mounted in a mid-rear position to optimise weight distribution over the front and rear wheels. The vertically-mounted 24kWh lithium-ion battery is located behind the benchseat and provides the car with a range of 100 miles. Batterycooling is ensured not only by the air channelled from the front to the back of the car, but also – and above all – by the flow of air that enters through the lateral scoops concealed behind the aluminium panels on either side of the body. The basic motor is the same as the unit used for Renault's production electric cars, although an evolution has enabled its power and torque to be uprated to 110kW (150ch) and 226Nm respectively. In order to optimise range and dynamic performance, Renault Design's technical teams have kept DeZir's weight to a minimum: its body is made from Kevlar, while its tubular steel frame is similar to that employed for the Mégane Trophy race car. DeZir's suspension also shares certain features with that of Mégane Trophy – including a double wishbone arrangement – to deliver a particularly high standard of handling precision. DeZir's aerodynamics have been carefully honed, too, thanks to full underbody fairing and a rear diffuser. The result of this work is a drag coefficient (Cd) of 0.25, as well as outstanding acceleration, with DeZir capable of accelerating from rest to 62mph in just five seconds. DeZir's energy efficiency package also includes the recovery of deceleration energy. The technology it employs is based on the same principles as the KERS (Kinetic Energy Recovery System) seen in Formula 1. When the car decelerates, kinetic energy is recovered and stored in the battery. In the case of DeZir, this energy can then be employed by the driver to provide a temporary power boost at the moment he or she chooses, using a button located on the steering wheel. Driving pleasure is further enhanced by the design of the driver interface. The dashboard visually mirrors the sensations felt at the wheel by means of a graphic display of data received from the accelerometer and speed sensors. The central touchscreen display incorporates a smart navigation system that synchronises journey information with the driver's diary in order to optimise task management and itineraries. Software incorporated in the dashboard provides drivers with a real-time indication of their energy management ability via a fun interface that uses video-game style graphics. 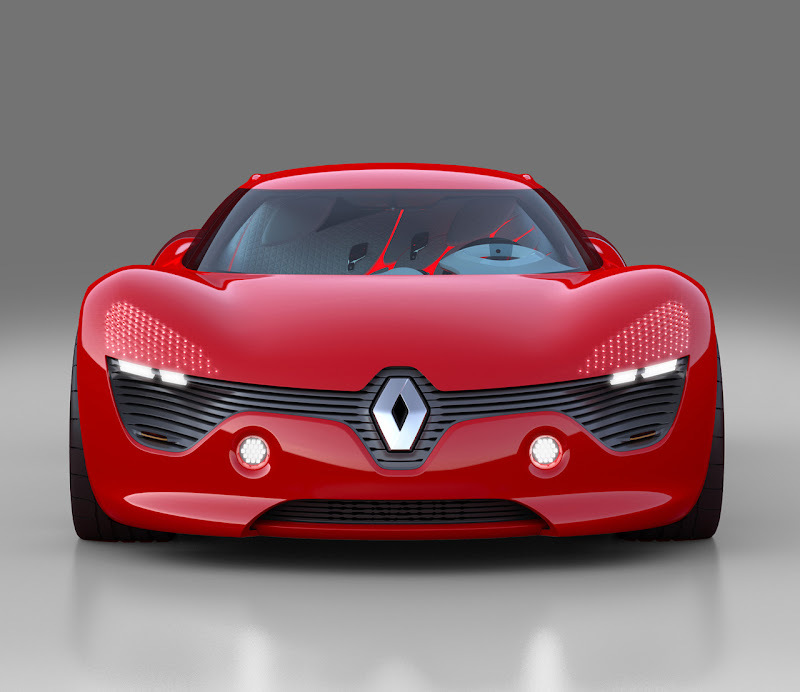 Within the framework of the creation of an audio signature for the brand's upcoming electric vehicles, Renault has been working closely with the highly-regarded IRCAM (Institut de Recherche et Coordination Acoustique/Musique, founded by Pierre Boulez in 1969) to define the sound that best reflects DeZir's personality.